Earn up to 1,400 reward points. Designed for long-term durability and reliable performance. KPX15A speakers are built to blast your main mix over a crowd or be positioned onstage as a monitor so you never miss a note. These powered loudspeakers are tuned to meet the demands of today’s performing musicians and DJs. The built-in equalization and internal power amplifier take the guess-work out of setting up your PA. Just connect the outputs of an audio mixer to the XLR or ¼ in. input of the KPX-A speaker, adjust the volume to a desired level and you’re up and running. 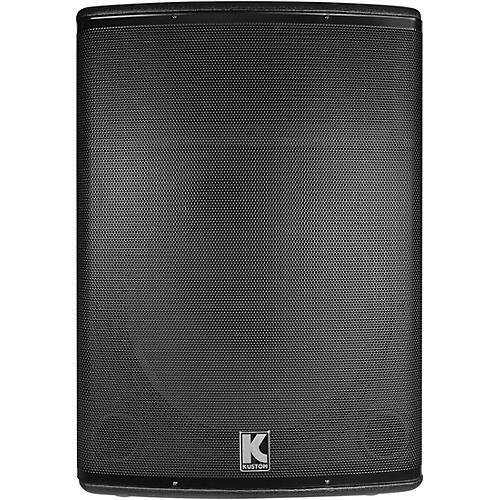 The KPX15A features extended low frequency response, an intelligible midrange, and pristine highs. The internal EQ curve is tailored for musical reproduction so house music and instruments shine while vocals sit perfectly in your mix. A special crossover maintains clear separation of frequencies for crisp, detailed sound reproduction. The KPX15A is equipped with a neodymium compression driver giving high frequencies the extra clarity needed when playing at high volumes. Kustom’s amplifiers, enclosures, and transducers for long-term reliability. The gigging musician and DJ can rely on the tour-tested mechanical design to withstand life on the road. Every time an artist or performer takes the stage, they can trust that Kustom won’t let them down. Great sound, great value—order today.